Dave Kiffer: O' Faux Tannenbaum! - We bought our first fake Christmas tree this year. Ketchikan: Listen to this KRBD story... The three public utilities and two communities that make up the Four Dam Pool Power Agency will receive money back this year under a resolution approved Thursday by the Four Dam Pool Board of Directors. As Deanna Garrison reports, the move could result in lower-than-expected KPU electric rates next year..
Ketchikan: Listen to this KRBD story... The Waterfall Resort on Prince of Wales Island announced Thursday that it is purchasing the airline division of Ketchikan-based PROMECH Air. Deanna Garrison has this report..
Craig: Listen to this KRBD story... Craig this month became the first community in Alaska to receive authorization to purchase halibut and sablefish quota shares. 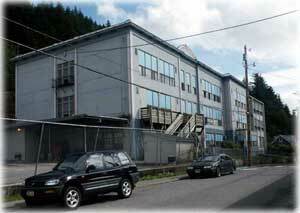 As Deanna Garrison reports, a non-profit corporation recently formed by the City of Craig will now be able to purchase the shares and lease them to resident fishermen..
Ketchikan: Forum Scheduled To Discuss Future of White Cliff School Property - Historic Ketchikan has scheduled a community forum for Tuesday night, Dec. 14, from 7-9 pm at the Ted Ferry Civic Center to discuss the future of the White Cliff School property.